In an environment where fundamentalist forces are bent upon derailing a democratically-elected government it’s high time for progressive and enlightened elements in Pakistan society to forge unity and shun dogmatism. If great Italian thinker and Marxist intellectual, Antonio Gramsi, can write “Prison Notebooks” without using jargon at a time when fascism prevailed in that country why can’t progressive and enlightened people in Pakistan ponder what mistakes they made during the last 63 years? Failure to do so would lead to nothing but chaos and fascism. Dr. Manzoor Ahmed, who bowed out on January 15 in Islamabad after protracted illness, reminds us of an ever-smiling, tolerant and down-to-earth Marxist who welcomed new ideas and did his best to organise young doctors at the Pakistan Medical Association (PMA), political and trade union workers, and believed in community work. He could have earned lots of money but right from the beginning he started his clinic at Shah Faisal Colony (former Drigh Road) inhabited by poor and lower-middle class people. The area was close to Landhi industrial area and factory workers would also come to his clinic when they were ill and if they had no money to buy medicines. Dr. Ahmed would give them money from his pocket. Political workers, especially full-time workers in the then underground Communist Party of Sindh, led by Imam Ali Nazish whose wages were equivalent to an unskilled industrial worker’s wage, would also frequent his clinic when they were ill.
Dr. Ahmed was a very simple, unassuming but committed person. He would have his lunch with his comrades, compounder and peon. People in the community loved him because he was not only a very good physician but cared about ordinary folk. Manzoor Ahmed was born in Hyderabad (Deccan) in 1930. His father worked in the education department; therefore, he had to move to different places whenever his father got a new posting. Ahmed did his Intermediate from City College, Hyderabad (Deccan) and became a close friend of eminent Urdu poet Makhdoom Mohyuddin and hero of Tilangana movement. When Indian forces attacked the princely state of Hyderabad to annex it, Ahmed and his brother joined the ‘Razakaar Force” that tried to repel the Indian forces’ onslaught but in vain. The Nizam of Hyderabad withdrew his forces but Ahmed along with a group of young people continued to fight the Indian forces. In 1948, his arrest warrants were issued and he was declared a rebel. Ahmed then migrated to Pakistan. “Dr. Ahmed knew the legendary communist leader Hasan Nasir, who was martyred in the infamous Lahore Fort in 1960 during the military government of Gen. Ayub Khan, since the days when he was in Hyderabad (Deccan) and remained in touch with him in Pakistan too when the revolutionary leader was underground,” Saleh Appa added. “I once asked Dr. Ahmed during a visit to his clinic whether he was diagnosing a patient or doing party work,” recalled Prof. Tipu Sultan, ex-vice chancellor Dow University of Health Sciences and president PMA (Centre). “Both!” said Dr. Ahmed. I remember the time when I first met him at his rented house in North Nazimabad along with my friend and former general secretary Sindh National Students Federation Mir Thebo. We had beer. Afterwards he bought a house in North Nazimabad that was often the rendezvous of writers and intellectuals. It was at his residence that I met eminent poet, documentary film-maker and a stalwart of Progressive Writers’ Association (PWA) Ali Sardar Jafri when he visited Pakistan in the 1970s. 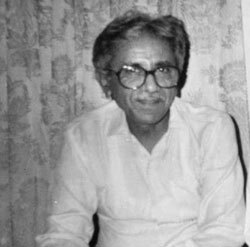 Ahmed was the darling of young doctors such as Dr. Qamar Abbas Nadeem (late), who was also a noted short story writer and Dr. Mazhar Haider. He was equally popular amongst Dr. Mahboob (late), Dr. Aziz, B.M. Kutty and Fatehyab Ali Khan. He was President, Karachi chapter of erstwhile National Awami Party (NAP) led by veteran nationalist leader Khan Abdul Wali Khan that stood for friendly relations with India and former Soviet Union and was looked with disdain by the establishment. The progressive movement of Pakistan has lost one of its best sons in the death of Dr. Manzoor Ahmed.